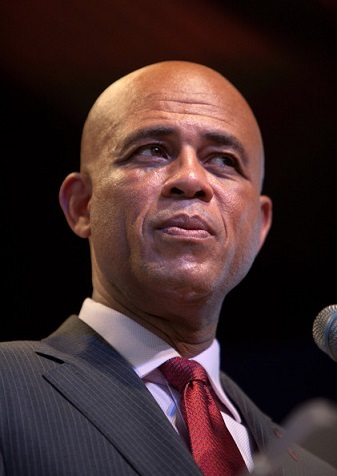 CSMS Magazine » Haiti: Michel Martelly trapped in a spider web! You Are Here: Home » Dossiers, News, World » Haiti: Michel Martelly trapped in a spider web! Haiti: Michel Martelly trapped in a spider web! As the dreaded Sunday Jan. 24th edges near, Haitians everywhere go to an ill-concealed frenzy, wanting to know what will happen to their island nation while the Haitian government and its international backers work in unison to install once more a stooge to rule the country. Will it work this time? Since 1915 and perhaps before that, no one becomes president of Haiti without being decreed by the United States—to the exception of Aristide in 1990, who won a landslide victory over Washington’s point man Marc Bazin. Of course, we all know what happened afterwards. Aristide was overthrown 9 months later, bundled out of the country, tamed abroad and reinstalled when it became clear he will never be a threat to foreign interests in Haiti. This time, things might be different. Washington and its cronies are having a hard time trying to force Haitian politicians to swallow their dignity—in exchange for some empty promises—in order to help legitimize Jovenel Moise, who is said to come out on top during the first round of elections which were held on October 25th—his votes were highly questionable. According to many observers, thousands of ballots were stuffed in his favor in a shameful political twist to ensure his victory and thereby prolonging Martelly’s hold on power as he would undoubtedly rule from below. Their stratagem was doomed from the get-go. At first, they were betting on Election Day which, by all accounts, turned out to be largely peaceful. Ensuring the execution of the grand scheme were 12, 000 UN peace keeping troops along with some 10, 000 Haitian police deployed throughout the country. By Election Night, they claimed victory, and they knew what they were talking about. With a day so smoothed, no one would have the moral authority to rein them in from their colossal magouy (Haitian term for political tricks or plots). Missing in the plot was an important factor they could not foresee or measure: The depth of public contempt for Michel Martelly and the immeasurable disdain the masses hold deep in their hearts for the International Community, especially the so-called Core Group, and everyone else who collaborates with them. Fueling this new wave of public discontent is the total lack of respect blatantly displayed by the actors on the stage against Haiti and the overzealous attitude of their proxies in dealing with a people yearning for poetic justice. Their disregard for Haitians runs so deep and so deliberately misconstrued that they never anticipated such public outcry. They had good reasons to frame their calculus this way, considering how they parachuted Martelly to the presidential runoff 5 years ago. This time, the people say NO. 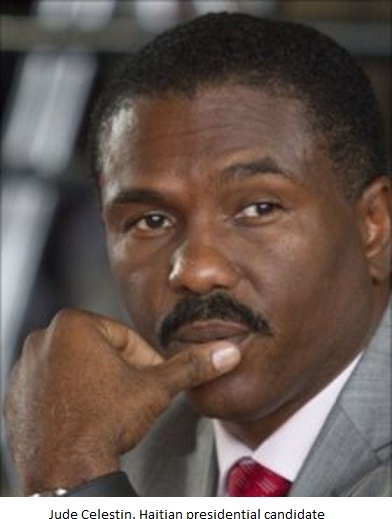 So do the presidential candidates who, in a rare show of unity, agree to contest every bit of disingenuous, mendacious justification put forward by Pierre-Louis Opont, Head of the Electoral Council, and Michel Martelly, one of the most vulgar and buffoonish individual Haiti could ever produce. Haitians now understand their game. By selecting traitors like Martelly, Opont and their cronies, they are making sure Haitians forever remain a beaten nation, good to no use and Haiti itself: an eternal basket case. The people have their own agenda. They want to do away with Martelly whose term ends on February 7th. At his place, they want a transitional government with the sole mandate will be to organize free and fair elections. “The “Core Group of international actors in Haiti (Brazil, Canada, France, Spain, the US, the European Union and the Organization of American States) appear convinced the elections should go forward.” This is according to Michael Deibert, The Guardian journalist who reports from Port-au-Prince and who, in a lengthy article, tries to implicitly justify Washington’s position in favor of moving ahead with the Sunday vote. 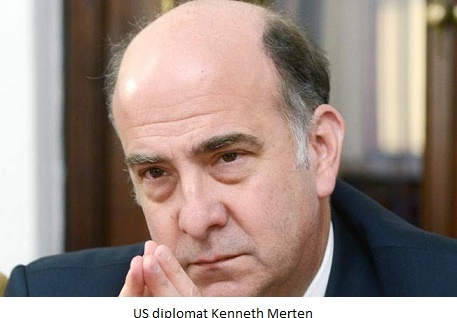 Beibert goes on to quote Kenneth Merten, the U.S. special coordinator for Haiti, who wrote in an email, “Proceeding with the electoral calendar as provided by the Haitian constitution will avoid going into an extra-constitutional, de-facto government leadership crisis.”Deibert does not say who this email was addressed to. This is like spitting on the faces of Haitian voters who watched hopelessly as their votes being rigged in favor of a Congo Sapeur embodied in the persona of Jovenel Moise. Mr. Merten’s nonchalance vis-à-vis Haitian independence is symptomatic to a deep-seated prejudice, historical in all its form, against the Western Hemisphere first black republic. When it comes to the Haitian reality, Merten, Clinton as well as Obama do not hold the truth in terms of what is or what is not good for Haiti. Only Haiti itself must decide its destiny. They claim to be promoting democracy in Haiti, but their actions prove they have a different version of democracy for Haiti, one totally at odds with what they profess in their own backyard. In this latest fight for political freedom, one has to give credit to the presidential candidates and their supporters, especially Jude Célestin who holds the key to Washington victory, but totally refuses to yield to pressure. Had he accepted to go along with the masquerade, it would have been far more difficult to stop the scheme against Haiti. Jude understands his position in history, and he rises to the moment. He could have done like many others before—betraying Haiti and playing by the rules set forth for conformist politicians. Instead, he has decided to hold firm. With his steadfast refusal, a wall is effectively built between the two sides—a wall only brute force could possibly break. Kenneth Merten may go ahead and order Martelly to proceed in installing Jovenel Moise as president, but the leadership crisis that he “wants” to avoid, will definitely materialize and further exacerbate an already protracted political crisis. On the eve of their own self-imposed deadline for the presidential runoff, Martelly and his camp now stand trapped in a blizzard of political quagmire. From coast to coast, the masses stand ready to fight for genuine democracy. A patriotic fever grows by the day. Earlier this week, hundreds of Haitians used small boats to stage a dramatic demonstration against the Royal Caribbean Cruise Line off the coast of Labadee, a beach resort used exclusively by the Cruise Line, while forbidding Haitians to enter the zone. Freedom of the Sea, one of its ships was forced to retreat as demonstrators threatened to storm it. Further to the northeast, it was reported that several ballot boxes were burned. Raising the stake is a last-minute resolution adopted in the Haitian Senate, demanding that the election be postponed. A showdown looms and perhaps may be inevitable. The crazies’ game and humiliating position have been exposed. So let it BE! For they have long morphed themselves into the new Conzé (s) of the 21st century. Shame on them! Whatever happens on Sunday, Haiti will survive, and will someday thrive!